I have found that anything written by J. Gresham Machen is worth reading. 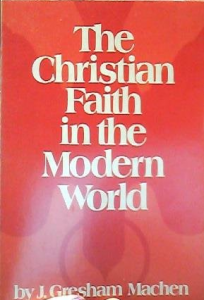 I was browsing a journal about Biblical subjects when I saw a chapter from this book reprinted in that publication. I immediately found a copy of the book on Amazon and bought it. It was originally published in 1936 but that publication was a transcribed copy of original radio broadcasts. As you read it you can feel the difference between Machen’s normal writing and his speaking. Either way the book does not disappoint. The chapter I first saw in that journal was “Is The Bible the Word of God?” In it Machen gives one of the best defenses for Biblical preservation from the historical point of view I have seen. A valid question from the KJV Only point of view is, “Do I have the Word of God in my hand?” I think that question needs to be answered, and I think it is entirely answerable without taking such an existential leap of faith. Machen points out how God providentially protected His Word, not by miraculous means as He did with the originals, but by His providential preservation in history and the church.